Both of these teams have booked their place in the Euroleague playoffs, so there may not be too much at stake with respect to that aspect of the season but both sides will be keen to finish as high in the table as they can. The Turkish side has been in fantastic form of late and their 16-12 record owes a great deal to three wins in a row and seven wins out of their last eight games. They’ll be determined to keep this run going for as long as they can but in Olympiacos Piraeus, they have tough opponents. The Greek side come into this clash knowing that they have home court advantage secured for the next round of the tournament and that the lowest they will finish in the table is in third place. However, there is a chance that the Greek side can finish in second place, although that is dependent on CSKA Moscow losing when they play on Friday night. Olympiacos will have to win their own game too though so there is plenty to play for in this game in Istanbul on Thursday evening. 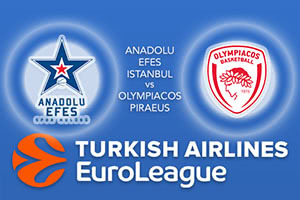 When these teams met earlier on this season, Olympiacos bagged a tremendous victory, winning by a score of 99-60. Vassilis Spanoulis was in excellent form that evening, offering up 17 points and 9 assists. This was the night when Efes endured their lowest points output for the season so the Turkish side will look to put that right by the end of this encounter. The Greeks welcome back Georgios Printezis, who was absent last week, and his 12.9 points per game so far this season have been of benefit. Spanoulis has chipped in with 11.7 points per game and Erick Green has offered an average of 10.2 points per game. Derrick Brown has been the key player for Anadolu, offering 13.1 points per game while Bryant Dunston, with 10.6 points per game and Thomas Heurtel, with 13 points per game, have been instrumental in the Turkish side’s good run. The Greeks will fancy their chances in this game so take Olympiacos Piraeus at +5.5 at odds of 1.90. For the Over/Under market, go OVER 154.5 at odds of 1.90. Bet Now!